Public Affairs > Criminal justice administration > Penology. Prisons. Corrections > The juvenile offender. Juvenile delinquency. Reform schools, etc. Sociology > Social pathology. Social and public welfare. Criminology > Criminal justice administration > Penology. Prisons. Corrections > The juvenile offender. Juvenile delinquency. Reform schools, etc. This title will be released on January 11, 2010. Like the first edition of Social Work and Social Welfare: An Invitation, this edition introduces students to the knowledge, skills, and values that are essential for working with individuals, families, groups, organizations, and communities in a variety of practice settings. 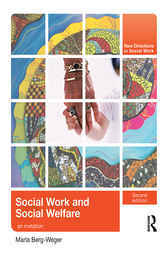 With updated demographic, statistical, legislative, policy, and research information; sensitive discussions of contemporary ethical issues; and new first-person narratives from social workers in a variety of fields, the second edition provides an up-to-date profile of the world in which today’s social workers practice. At www.routledgesw.com/intro, you will find a wealth of resources to help you create a dynamic, experiential introduction to social work for your students.